We had a bit of a non-traditional Thanksgiving and it was just wonderful. This year it was just us -- husband, wife, nobody else! We know this will be the very last time that we have a holiday like this, and it was nice to soak that up. The holidays can often times take it out of you ... travel, large gatherings, lots of cooking and cleanup. Our day was simple, easy, relaxing. Perfect. I did a grocery run on Monday and Ian picked up a few more items Tuesday -- other than that, we avoided the crowded stores. When planning out the menu, we focused on what we really loved and cut out all of the extra side dishes that would just add time and effort. 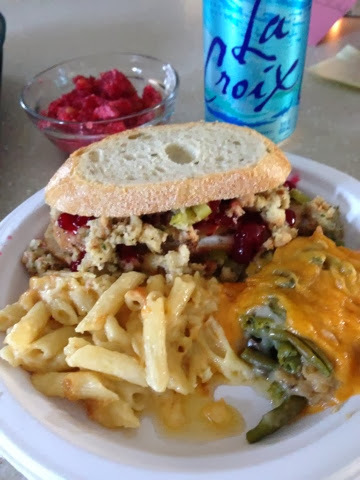 For example, we knew we wanted stuffing and mashed potatoes, so to reduce the starches we decided to forego the sweet potato casserole and dinner rolls. Football played during the day (which I actually love as Thanksgiving background noise) and I did as much food prep as I could on Wednesday evening and Thursday afternoon. We even were able to get in two walks during the day -- one in the morning with hot chocolate, and one in the afternoon. We walked 2.25 miles total, so not a full 5k Turkey Trot, but still enough to help make up for the big dinner ahead! I had fun setting the table -- I used a tartan round tablecloth as a topper that I picked up at an estate sale this summer. It matches our tartan plates and saucers from Williams Sonoma perfectly and is a fun nod to Ian's Scottish ancestry. We whipped out the fancy (i.e., non-dishwasher-safe) glassware for the evening, Ralph Lauren stemware and gold-banded Williams Sonoma water glasses. The tartan plates and gold-banded glasses were all post-holiday sale finds last year. Right before sitting down around 5pm, I realized that I didn't have a gravy boat -- for the girl who has every cooking vessel under the sun (according to my husband), I was shocked! Luckily I had two of these little white pitchers so we had our own individual gravy servers. It ended up actually being pretty cute. Rather than cooking a large bird, I went with a 3-lb turkey breast roast that I cooked in a turkey bag -- so easy, no elaborate carving required, and it still was enough for dinner and next-day sandwiches for two days. That last-minute grocery store trip Ian took Tuesday was primarily to get canned cranberry sauce. He loves the old school, sliced-right-out-of-the-rippled-can version. I also made fresh cranberry sauce and a cranberry salad. Before dinner we both spoke about what we are grateful for this year, and boy did we have a wonderful list going. We listened to Edith Piaf on the stereo and mmmmmm-ed through the entire meal. It was so delicious! 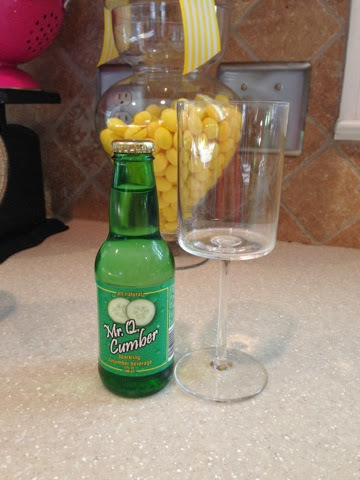 I had to get creative with drinks this year and I was so excited to find this all natural cucumber soda at World Market last week. It was so tasty! I would definitely recommend picking this up and plan to get several more for upcoming holiday parties and get-togethers. And who are we kidding -- the best part of Thanksgiving is the leftovers! Ian picked up the most amazing rosemary bread that made for a delicious sandwich with Duke's mayonnaise, turkey, stuffing and cranberry sauce. I'm proud of us that we carried off a full Thanksgiving dinner with absolutely zero stress, tears, or meltdowns in the kitchen. It was just easy and chill. We have so many blessings to reflect on and it was such a special way to toast an exciting year ahead for us. I hope your Thanksgiving was filled with lots of love! This sounds like the perfect Thanksgiving celebration. We just celebrated with us, my mom and dad...it was so relaxing, which made it that much better. Perfect Thanksgiving! Love that it was just the two of you for the last time EVER! Good for you still doing a thanksgiving meal for just the two of you... I'd be lazy and go out lol. It all looks delicious! This has got to be the sweetest Thanksgiving. I'm sure the two of you will remember this for years to come! I LOVE the idea of having a last Thanksgiving as just the two of you. That's precious! What a wonderful way to spend you last Thanksgiving as a family of two!!! The food looked delish as well! I'm glad you shared this! It's just Joel and I for Christmas Eve and Christmas this year and I've been a little nervous about it being lonely and not as special. I'm hoping we can come up with lots of creative activities - and try and soak in the lack of stress and craziness that the holidays most certainly do bring. Leftovers are the best! I had a bowl or mashed potatoes. Stuffing, gravy and turkey Friday. Heaven. Is it selfish to say that JM and I tried to do a Just The Two Of Us Christmas this year? I think a "Duo Only" holiday is a MUST for us before we have kids someday. How perfect. Love the tablescape and menu! I'm still full from Thanksgiving but this made me hungry again! Loving the antlers on the table! Ok, this is the sweetest little meal EVER! I love that you guys still put a lot of effort (but not so much that it was overwhelming) and made your own tradition. love it! The next day meal looks just as good as your Thanksgiving meal! yum!!! This is so sweet! While I can't ever imagine being alone on Thanksgiving (since all of our family is so close), I think this might be fun...just once! And I love that you still went all out, even though it was just the two of you! This all looks so yummy! 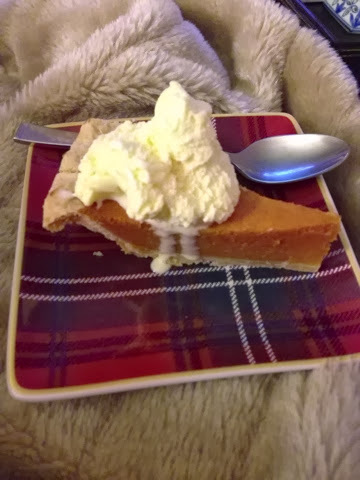 It's so funny-- we never have pumpkin pie at our Thanksgivings! It's always sweet potato pie or pecan pie. My husband thinks it's blasphemous! Pepper and vinegar turkey you say? Now that sounds delicious! I love that you did the whole meal yourself, I haven't attempted it yet. That table setting is beautiful! While I am not too sure about the canned cranberry sauce, it looks like you had a lovely Thanksgiving! What a great day?! Love your table... especially the cotton!! Just think...next Thanksgiving you'll be a MOMMY! How exciting! :) Happy Monday! Now that is a perfect Thanksgiving!! And my goodness your leftover sandwich looks unbelievable!! Happy Thanksgiving! I love those gold-rimmed water glasses. what a sweet dinner for two! love your tablescape, especially since it ties to ancestry. We def bought the canned cranberry for Weeks and he loved it! Yum! Everything sounds great, and your table looked beautiful! What a sweet, sweet Thanksgiving that y'all will remember for years! I love that! May I ask where you got the antlers you have on your table!? I'm laughing because my mom also loves the canned cranberry sauce and insists on it for Thanksgiving and Christmas. My brother is a total foodie and makes homemade cranberry sauce every year. It drives him insane. HA!